Public speaking ranks among the top fears for most people, yet every Charleston Day graduate can claim it as a core competency. 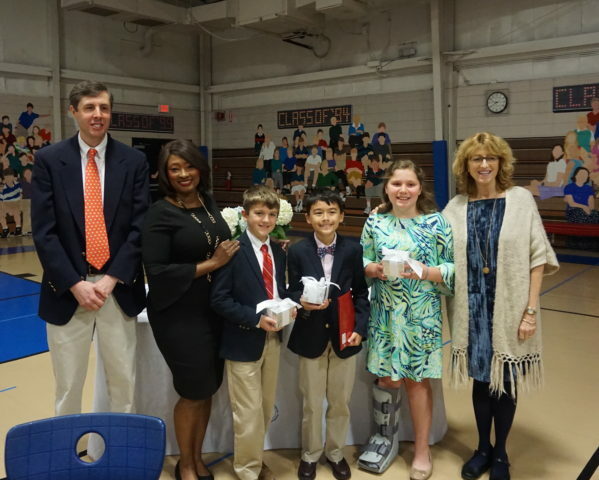 Those skills were demonstrated this March as the fifth grade participated in the annual Dottie Rhett Speech Contest. Each fifth grader had a speaking part: six students delivered a speech they researched and wrote in class, one served as Master of Ceremonies, one made the formal introductions, and the others presented dramatic readings. The event followed months of researching, writing and preparing their own speeches in class during a Writers Workshop. Students learned skills such as taking notes, forming outlines, and citing sources, following MLA style. Each student presented before a group of internal judges who chose the six finalists. Topics from the six contestants were Alaska, The Hidden Secrets of Disney World, Famous Speeches in History and their Impacts on the World, Should Graffiti be Considered Art?, The Health Benefits of Dogs, and Evolution of Music: 20th Century. 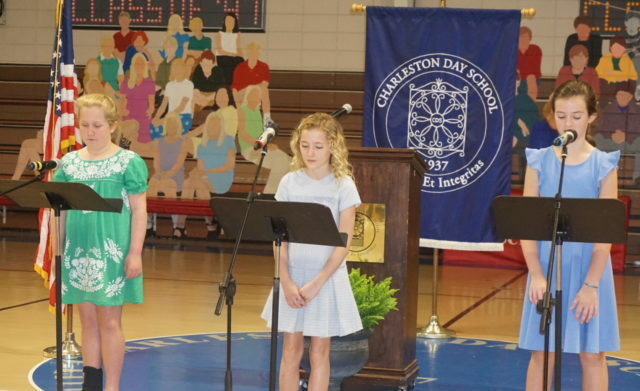 Public speaking instruction is woven throughout Charleston Day’s curriculum beginning in kindergarten. As students advance through the grades, they always have a speaking part, whether as the mayor during the first grade Community Helpers show, performing in French during the fourth grade Lion King play or reciting Shakespeare in the seventh grade Julius Caesar production. The fifth grade contest is a highlight of the curriculum. Fifth graders present an excerpt from Number the Stars by Lois Lowry. 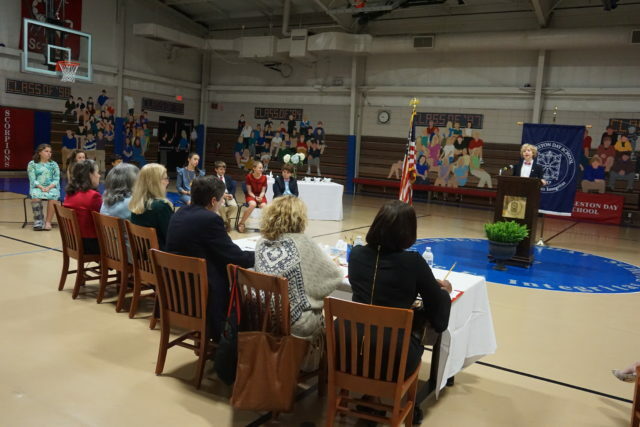 The program was started by Mrs. Dottie Rhett, a fifth grade language arts teacher who firmly believed that every child should acquire public speaking skills. The contest was named in her honor after her death in 2014. Her husband, the Rev. Dr. William Rhett, Jr. attends each year. The three winners of the speech contest with the judges. We’d like to thank our judges–CDS Alumnus Dr. Richard M. Cutler III, News 2 anchor Mrs. Octavia Mitchell and S.C. Poet Laureate Ms. Marjory Wentworth. DR. RICHARD M. CUTLER III is the owner of Cutler Animal Hospital. After working downtown as an associate veterinarian at All Creatures for seven years, he opened his vet clinic to serve both new and old clients from the West Ashley, Downtown, Mt. Pleasant, and surrounding areas. Dr. Cutler graduated from Charleston Day School in 1996, from Woodberry Forest School in 2000, and then completed an undergraduate degree in history from Davidson College (’04). He attended vet school at Massey University in New Zealand and spent the next five years exploring the country’s natural beauty before returning to the Lowcountry to practice veterinarian medicine. OCTAVIA MITCHELL anchors “News 2 Today” and “News 2 at Midday.” An Emmy award winning journalist, she has been a member of the Count on 2 Team since 2002. Mitchell is a graduate of Lincoln High School in McClellanville, and she received her Bachelor of Arts in English and Broadcasting from South Carolina State University. Every week, Mitchell’s Cool School segments highlight the many positive and effective programs and community initiatives in local schools. MARJORY WENTWORTH is the New York Times bestselling author of Out of Wonder, Poems Celebrating Poets (with Kwame Alexander and Chris Colderley). She is the co-writer of We Are Charleston, Tragedy and Triumph at Mother Emanuel, with Herb Frazier and Dr. Bernard Powers and Taking a Stand, The Evolution of Human Rights, with Juan Mendez. She is co-editor with Kwame Dawes of Seeking, Poetry and Prose inspired by the Art of Jonathan Green, and the author of the prizewinning children’s story Shackles. Her books of poetry include Noticing Eden, Despite Gravity, The Endless Repetition of an Ordinary Miracle and New and Selected Poems. Wentworth teaches at The College of Charleston and The Citadel. She is the Poet Laureate of South Carolina.